Gophers football coach P.J. Fleck grabbed a water bottle from a student manager seconds before kicker Emmit Carpenter attempted a 40-yard field goal during Thursday’s spring practice. Fleck then squirted ice-cold water on Carpenter’s stomach while the 2016 Big Ten kicker of the year lined up holder Jacob Herbers’ spot and angle to the goal posts. Carpenter’s kick sailed through the uprights. While that would be good enough in the Big House against Michigan come November, that alone won’t cut it during Fleck’s frenetic practices this spring. The nets behind the end zones on the indoor field at the Gibson Nagurski Football Complex have maroon-painted lines to the measurements of actual field goal posts, but Fleck has added narrower gold lines a few feet inside each upright to represent the new standard. While “elite” is the standard bearer among Fleck’s Gopher Talk buzzwords, “plus-three” was zipping around the three practices Minnesota held this week. That lingo means players need to add three to everything they do — three more yards on a warm-up jog to three more numbers higher on their grade-point averages. With Fleck’s practices, it’s more like plus-30. “It’s chaos,” said Minnesota departed senior safety Damarius Travis, who watched Sunday’s practice from the north sideline at TCF Bank Stadium. The Gophers will go from 11-on-11 team reps to special-team snaps to mano-a-mano blocking drills in the matter of three minutes. When they transition on the sound of an airhorn and Fleck being mic’d-up, the players have 20 seconds to produce the next rep. In that one-on-one blocking showcase, offensive players line up along one hashmark, with the defense stretching out on the other. Fleck’s in the middle, calling out a player from each side to meet in on the “M” logo at the 50-yard line. Once, it’s starting linebacker Jon Celestin, known as “Thumper” for his big hits, versus Nate Wozniak, an imposing 6-foot-10 tight end. Wozniak blocks as Celestin fights though it. Afterward, teammates mob the winner like the crowd to a frontman at rock concert. Travis’ description matches Fleck’s own chaos theory. Running back Rodney Smith was mightily successful under the old format curated by fired head coach Tracy Claeys. Smith, who rushed 240 times for 1,158 yards and 16 touchdowns as a sophomore in 2016, acknowledged it was a “challenge” to adopt to the new pace. Fleck has needed to evolve the format that he earned notice for during his four years at Western Michigan. Minnesota has a total of only five healthy offensive lineman in spring practices, so he’s had to cut down on team reps and increase the number of seven-on-seven passing portions, with O-linemen doing drills on the side. During practices, Fleck shows an attention to detail in all facets. When running back Shannon Brooks ripped off a big touchdown, he dropped the ball after cross the goal line. Fleck drew the line and stopped practice. Fleck will also home in on players displaying bad body language, with cornerback Kionde Thomas and wide receiver Rashad Still on the receiving end Thursday. Smith has seen more details stressed on special teams, too. Fleck will also praise big plays and will keep it light-hearted. After Merrick Jackson made a play, Fleck jumped on the back of the mammoth defensive tackle; he ran 30 yards down the field to congratulate Jaylen Waters; and he line-danced for a few seconds to Old Crow Medicine Show’s “Wagon Wheel” on the speakers as his charges ran a play. Before Tuesday’s practice, Fleck referenced Chicago Cubs president of baseball operations Theo Epstein’s vision with his players. Before Thursday’s practice, Fleck discussed the players’ moms and grandmothers to drive home his talking point on the Gopher Talk acronym of F.A.M.I.L.Y — forget about me, I love you. “We made it more personal, it wasn’t just some celebrity we always use, or a No. 1 leader in sports,” Fleck said. 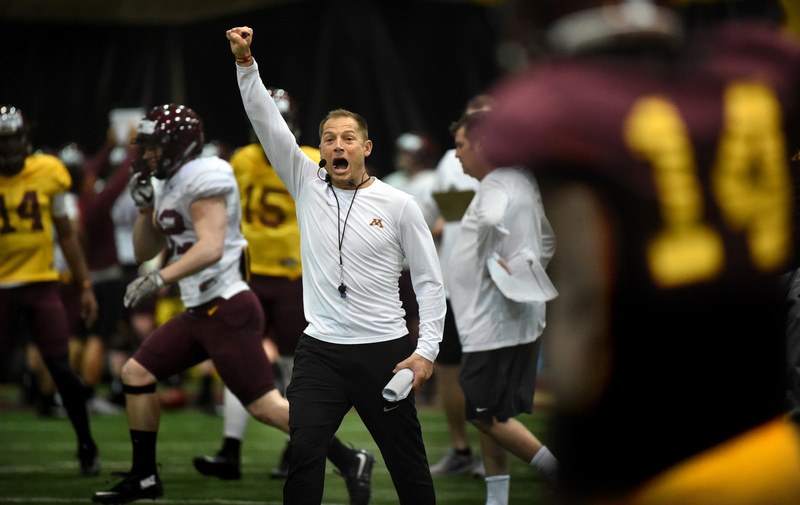 Fleck’s lieutenants are also tone-setters throughout practices. “Compete at everything,” said Gophers wide receivers coach Matt Simon, a Farmington native.